If you have come directly to this page via a search engine, you may choose to start at the beginning and go to the SPEC Distribution Inc. Home Page. 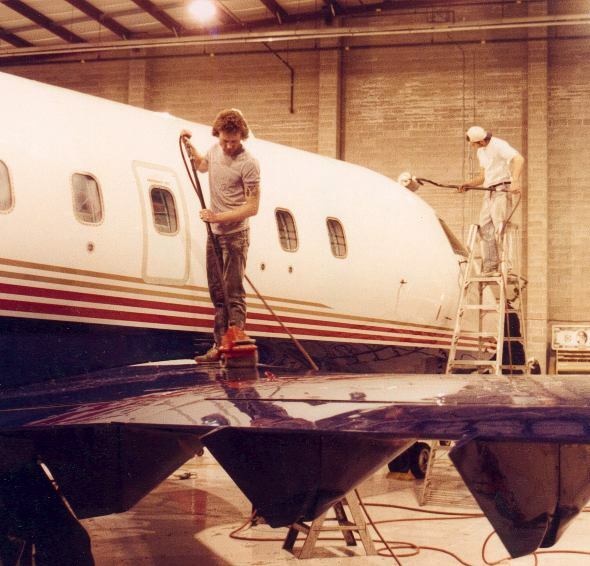 for useful information on, aviation polishing/cleaning products & techniques. PLEASE NOTE: All units shipped after July 1, 2013 were shipped with the newer HIGHER TORQUE ATLAS COPCO air motor power units. (See below for specifications). All Serial numbers end in "C"
Industrial "Hand Held" Large Surface, Deep Cleaning/Polishing/Buffing/Surface Texturing Equipment. "DRUM TYPE" Polishers have been developed to RAPIDLY "deep clean" & polish, plus, provide a "consistent" finish, on very large surfaces. The SPEC Machines "Drum" type polishers are indeed, the most advanced, reliable, versatile, productive and largest, industrial "hand held" surface polishing machines, available on the market today. Important to note: Similar units, available on the market, operate in the over 3000 RPM range and at lower torque outputs. The lower rpm (2500 rpm)with higher torque output SPEC Machines units, allow for far less stress on the polishing pads and parts, and allow more forgiving and exacting, operator control. The "DRUM" type polishing machines do not completely replace, "circular" type polishers, but greatly augment the polishing / cleaning process, specifically on large surfaces. 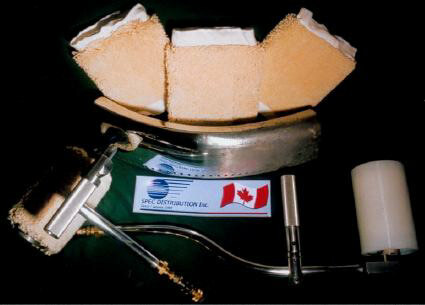 "Drum" type polishers, used with proper techniques & polishing products, will allow for a far more efficient, consistent and longer lasting finish, on a wide variety of surfaces, (painted, bare metal, aluminium, composite, plastic, acrylic, Plexiglas, Lexan, etc.,). The most notable benefits of utilizing air driven "DRUM" type polishers is a greatly reduced labour time, (approximately 1/3rd to 1/2 that of circular polishers. 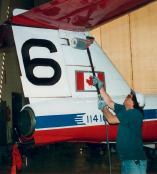 ie: a DeHavilland Dash 8, - 78 - 100 man hours with circular polishers verses 22 - 30 man hours with Drum type polishers. 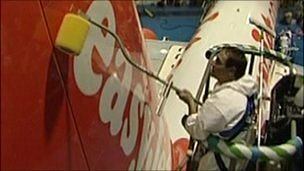 An AIRBUS A320, 6-800 hrs vs 2 -300 hrs using DRUM type polishers. A Bombardier "Global Express" wing leading edge 2 - 4 hrs, verses 8 - 12hrs. ), with improved safety, to not only the operators, but to the work surface itself. 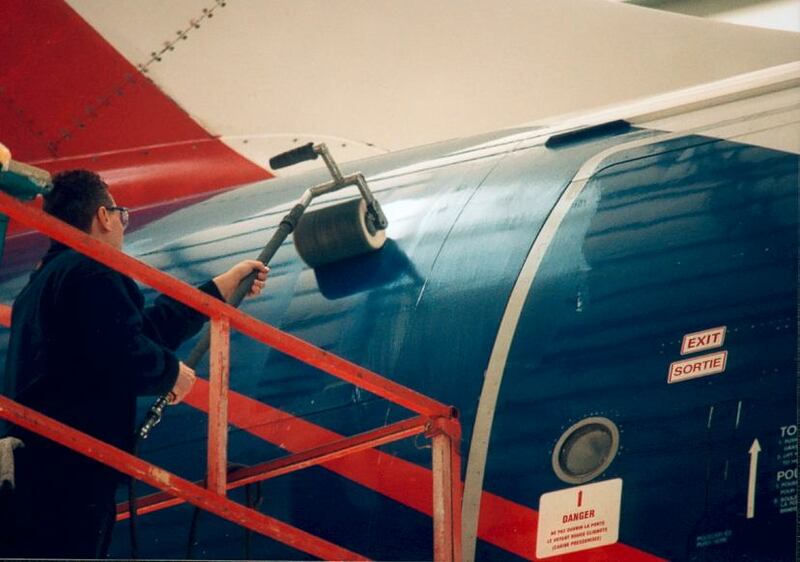 Keeping todays commercial aircraft "clean" is an important and ever increasing challenge. Commercial airliners are getting bigger, are being pushed through more "cycles", and are operating in increasingly harsh environments. The equipment we manufacture and techniques we recommend, address these challenges safely and efficiently. 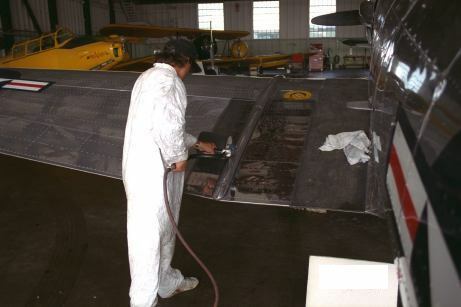 As with any "restoration" or initial cleaning you may find you will use more product in the beginning, but after the initial "polishing/deep cleaning" of each aircraft, a "substantial" decrease in quantity and type of product will be required for routine maintenance. 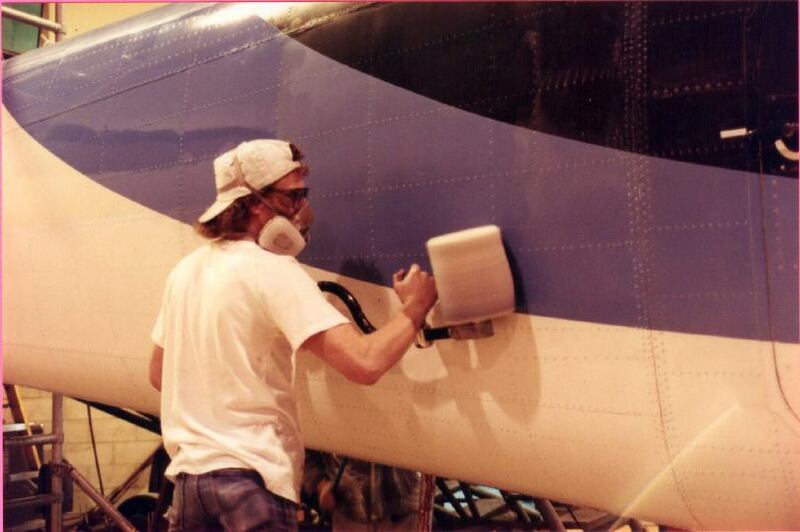 For instance, a 1 gallon (3.78Liter) of a high quality "CERTIFIED" Paint Polish Sealant will do 1 or 2, "737" size aircraft quite easily, (1, if including wings, tops and bottoms or 2, if doing fuselage only). Initially, the use of "CERTIFIED""paste type" polishing compound is highly recommended, (a heavier "CUT" type compound may be necessary for some areas), to deep clean and polish painted surfaces smooth, (without affecting the paint hardness). This step will "deep clean" and prepare the paint efficiently and properly for the use of the Polish /Sealant, or similar type product. 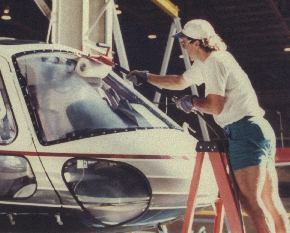 Once the exterior of the aircraft has been "polished properly", REGULAR "Polishing", is really, totally unnecessary, even in a tropic / salt water environment. To maintain the exterior finish, only an annual, or in extreme cases, a bi-annual "polishing" is usually, all that is required. 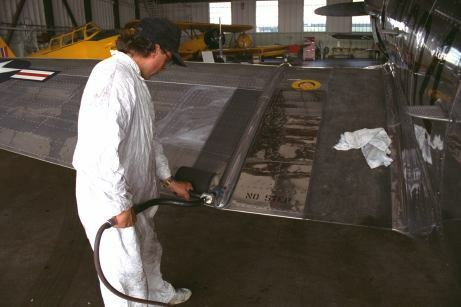 Some areas of high wear or abrasion, like aft of: exhaust, landing gear on belly, APU protection plate, leading edge areas and such, may require more frequent attention. A good annual or bi-annual "Polishing" will most definitely retard, if not completely prohibit, any type of surface corrosion. Regular "Cleaning" or "Washing", with an appropriate product, every two months or so, is usually all that is required to keep all areas clean to allow easy identification of any visible defects, cosmetic or otherwise. General cleaning should be done with a good surface cleaner on an "as required" basis, dependent on your operational environment. The "bright work" is easily maintained by a regular simple "wipe down" with a "CERTIFIED" Aluminum Polish / Sealant to clean, maintain and "re brighten" the surface. There are two basic large models. The SPEC "SA"(short arm) and "LA" (long arm). Simply put, the "SA" is simply more versatile especially for "up close" work. The "SA" can be turned into an "LA" (long arm) by simply attaching a 2 ft extension handle. The SPEC"LA" cannot be turned into an "SA". The SPEC "LA" is primarily for doing large surfaces from a "stand off" distance. Both units use the exact same Atlas Copco power unit. All parts from all units are interchangeable. The SPEC  Model "SD" uses a special drum that can accept standard "Synthetic" abrasive 8"D X 3"ID wheels, ("stacked") or "Combo Flapwheels". It has been designed for surface "texturing" or rapid oxidation / material removal that can be executed, quickly, efficiently and safely. (On "large" surfaces, approximately 5 times quicker that Palm or "Jitterbug" hand type sanders.) Contact us for more details. Please note: "DRUM TYPE" polishers are intended for, and work best for, finishing and general "routine" maintenance on large surfaces. They do not work well for corrosion or material removal, unless used with the SPEC "SD" drum & speciality abrasive brushes, (available from several manufacturers). 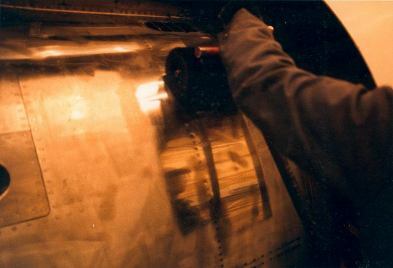 For this type of work or "initial" restoration on aluminum and bare metals, the "SD" Drum is far more productive and will rapidly remove corrosion. ( On smaller pieces or areas, the SPEC 1300B Series II "Detailer" with standard 6" polishing wheels is excellent for this purpose. Circular polishers, are also effective, but they will leave polishing, (swirl), marks. 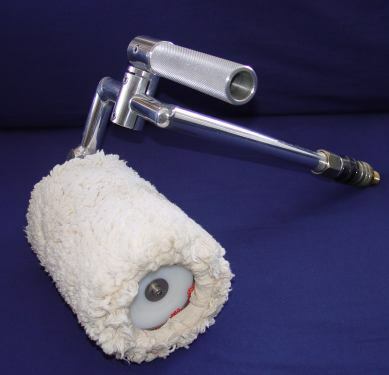 The SPEC DRUM TYPE polishers with the Wool, Cotton or "Synthetic Blend" pads will rapidly remove the "polishing marks" left by the circular type polishers and allow for rapid and efficient ongoing maintenance. The SPEC Machine model "SA", "LA", "SD" and SPEC 1300B "Detailer" Drum polishers all require a consistent air supply of a minimum of 30 cfm (cubic feet per minute) @ 85 - 90 psi, for maximum performance, (full torque). A "Rotary Screw" or "Helical" type compressor is recommended. An "AIR DRYER" or "CHILLER" is aslo highly recommended for optimum tool performance and longevity. Our ongoing commitment is in providing our customers with the finest products possible. SPEC Distribution International Inc. has undertaken the task of designing, developing & manufacturing the most advanced, reliable & versatile, industrial, "hand held", large surface polishing machines, available on the market today. They may look simple, but have been designed for INDUSTRIAL use. We have taken all the best features of current and past "DRUM" type polishers designs and improved on them. We have designed and built this equipment with extensive and valuable input from our customers who specilize in the "large surface" industrial polishing markets. These clients include: BOMBARDIER AEROSPACE Inc, COMAIR, LEARJET (Div. Bombardier Aeronatique), NASA's (Dryden Flight Resaerch Center), BOEING / McDONELL DOUGLAS, QUANTAS Airlines, AERO MEXICO, DELTA Tech Ops, LUFTHANSA TECHNIK, EXECUJET (Dubai & Nigeria), QATAR Exec (UAE), FBO SKYSERVICE, INNOTEC / EXECAIRE, FALCON AVIATION (Dubai), AIR CANADA & AIR CANADA "JAZZ" & "ROUGE", DASSAULT / FALCON (Reno Nevada), CANADIAN DEPT. OF TRANSPORT (SPECIAL AIRCRAFT SERVICES DIRECTORIATE), C.A.M.E.C.O. (China Aircraft Maintenamce Engineering Company Ltd.), A.I.D.C. (Aerospace Industrial Developement Corp.) Taiwan, to name just a few. Productivity: On large surfaces the SPEC Machines "DRUM" type polishers are unparalled in their capability to reduce labour time and increase producitivity. "DRUM" type polishers do not completely replace, "circular" type polishers, but greatly augment the polishing / cleaning process, specifically on large surfaces. 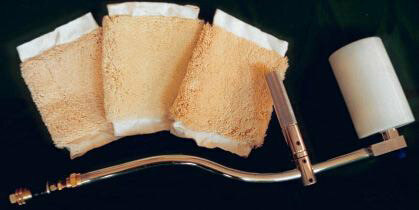 "Drum" type polishers, used with proper techniques & polishing products, will produce a far more efficient, consistent and longer lasting finish, on a wide variety of surfaces, (painted, bare metal, aluminium, composite, plastic, acrylic, Plexiglas, Lexan, etc.,). The most notable benefits of utilizing air driven "DRUM" type polishers is greatly reduced labour times, (approximately 1/3rd to 1/2 that of circular polishers. For example: a DeHavilland Dash 8, - 78 - 100 man hours with circular polishers verses 22 - 30 man hours with Drum type polishers. A Bombardier "Global Express" wing leading edge 2 - 4 hrs, verses 8 - 12hrs. An AIRBUS A320, 600-800 hrs down to 250 hrs. ), with vastly improved safety, to not only the operators, but to the work surface itself. 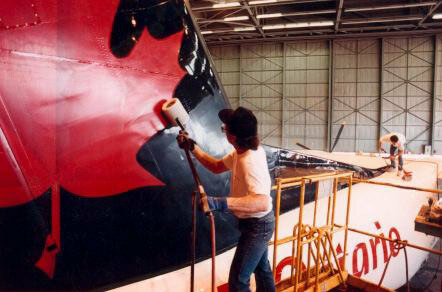 QUIET: Most of the current air driven drum polishers that operate in the over 1 hp range, produce motor noise levels, at or above, 95 decibels (a Boeing 747 is about 145 decibels on take off). SPEC Machines, have been designed & tested to operate, at full throttle ("free"), below 75 decibels at a distance of 1.5 meters, (4ft). This is a huge plus, in not only reducing overall fatigue for the operator, but for those working on other tasks, in the same area. VERSATILE: Interchangeble configurations. SPEC Machines are easily changed in configuration, simply using a standard 3/16" Allen type key. The air motor or "heart" of the machine can be attached to any one of the three drum sizes/type with one, 10/32 Grade 8, SS Allen bolt. The drum/motor assembly can be attatched to either of the two types of handles. The control handle is adjustable to assure full, safe and accurate operator control of the tool, regardless of the type of operation, all with a 3/16" Allen key. SIMPLE: SPEC Machines utilize "standard" parts. For instance, replacement air motor blades for the Atlas Copco air motor are available WORLD WIDE, through any Atlas Copco dealer or representitive. All the bearings we use are "standard "and available from any reputable bearing supplier. POWERFUL: SPEC Machines use, an Atlas Copco "LZB" industrial air motor with "sealed & isolated" TRIPLE gear reduction units, that operate at 2400 RPM Max., producing 9.3 ft/lbs (12.6NM) of torque, with an air consumption of 30 cfm @ 90 psi. (Similar competitive units operate @ 4000 RPM with 5.6 ft/lbs (7.6NM) of torque. SAFE: Operator saftey is of prime concern. The manner in which "DRUM" type polishers operate, allow the operator to work in a "natural "standing position, controlling only the rate at which the machine moves away from the operator, across the surface. Circular polishing on large surfaces, require unnatural operator "twisting", resulting in potential back strain and loss of tool control. All SPEC Machines units come with a complete 1 year warranty on all parts, (except air muffler & air motor blades.) Any warranty repair or replacement of parts shall be done at NO CHARGE within the warranty period. Subsequent suggested annual inspection & or tune up's - Customer is charged for parts only, no labour charges will be applied for life of equipment, (as long as customer is original owner of equipment.) With a clean, dry air supply, we are seeing between 2 &3,000 hrs TBO, (Time Before Overhaul), ("Overhaul", being an Atlas Copco "Service Kit (Part# AC-SK) @ approximately $195.00 US (Price may vary depending on current currency exchange rates & other variables). The picture on the left above, shows the SPEC  Machines Model "SA" in it's standard configuration for "BUFFING" and "FINISHING" with a SPEC48C, 4"X8" (Cotton) pad . Pictured on the right above is the SPEC  Machines Model "LA" & some SPEC58C 5" X 8"(Cotton) pads. Below shows the available SPEC SD39 optional or additional drum. Fits easily on both an "LA" (pictured) or "SA" unit. Allows for use of any 3" ID accessory. NOTE: Standard Model "SA" & "LA"can easily be converted to this configuration by simply purchasing the SPEC "SD39" DRUM separately. Above left shows the Model "SA" converted to it's " SURFACE TEXTURING / MATERIAL REMOVAL" configuration with the specially designed drum (#SPECSD39) that will accept either a 4" wide X 8" diameter (shown above on left) ScotchBrite® only Drum or (middle) a 6" wide X 8" diameter, 3M Scotchbrite® "COMBO Flap DRUM" (Grey Scotchbrite interlaced with 280G Aluminum oxide paper) perfect for heavy corrosion, paint removal or metal surface "texturing" producing a "SATIN" or a particular "Scratch Pattern" Textured Finish. Pictured on the right, using the same drum, it can accept single or multiple, (stacked) standard 1/2"wide X 8" Diameter polishing wheels, (available in many types & varieties) for tool mark repair, heavy material suface alteration or "texturing" etc. Contact us for more information or details on "Rapid" corrosion, oxidation, material removal or surface "Texturing" on large surfaces. The control handle is fully adjustable, using a standard 3/16" allen key, (comes with each unit) to assure proper and safe operator control, "over center" for exact control or on the extension handles as pictured below. (Also can be re-configured easily, for "Left Handed" operators). The SPEC  Machines Model "LA" with the 5" X 8" drum and SPEC58 pads. This configuration is for polishing very large surfaces from a "stand off" distance or standing position. 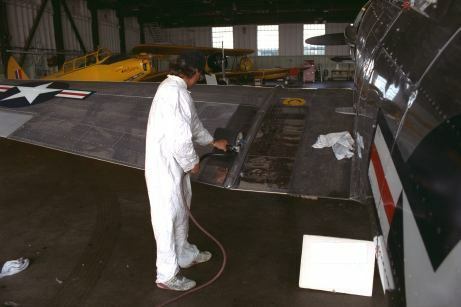 For instance, aircraft fuselage sides and crowns or in the case of the top wing surfaces, the operator can be in a comfortable standing position, as opposed to "hunched over" when using circular type polishers. The use of an optional 2 ft extension allows for a greater (and safer) "reach" (see pics further below on this page). 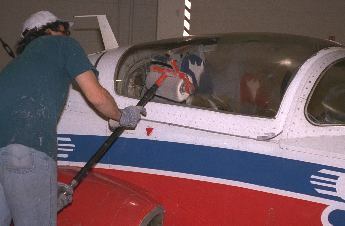 The tool actually becomes "weightless" on fuselage sides and crowns as it will "climb" or "walk" away from the operator. All the operator has to do, is control the speed or rate, of the walk or climb. The control handle (shown in the extended position below) can be easily re-positioned for maximim operator comfort and control. Above: For size comparison, picture shows SPEC "LA" & "SA", with & without 2' Extension handle (Part# SH2X). 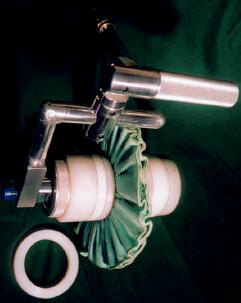 Below demonstrates the "Safe Reach Capabilities" of the SPEC Machines "DRUM" type polishing machines (with & without SH2X, 2' Extension handle). 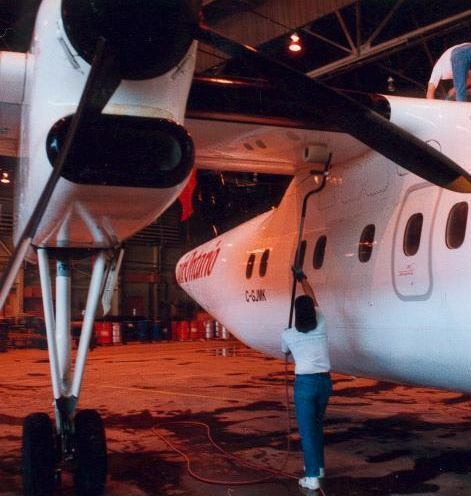 The picture on the top left is of the horizontal tail on a DeHavilland "DASH 8". It is approximately 30 ft (15 meters) high and you can only get the lift so close to your work. The center picture demonstrates the "reach" of a SPEC Machine in a rather tight area for a scissor truck or similar. 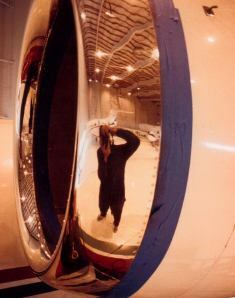 The picture on the far right shows a polishing operation on a wide body AIRBUS A330-300 using one of the drum buffers with two, 2 ft (61 cm) extension handles attatched. (A 6 ft (1.8m) extension is also available). 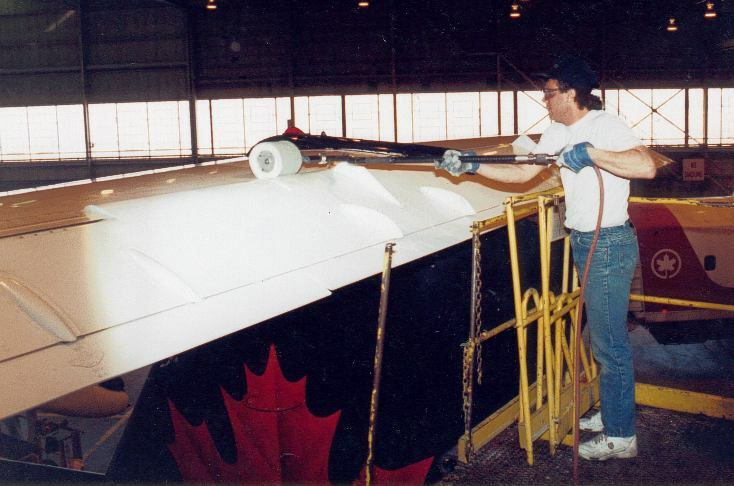 This truly demonstrates the safe "reach capability" of the SPEC Machines polishers. 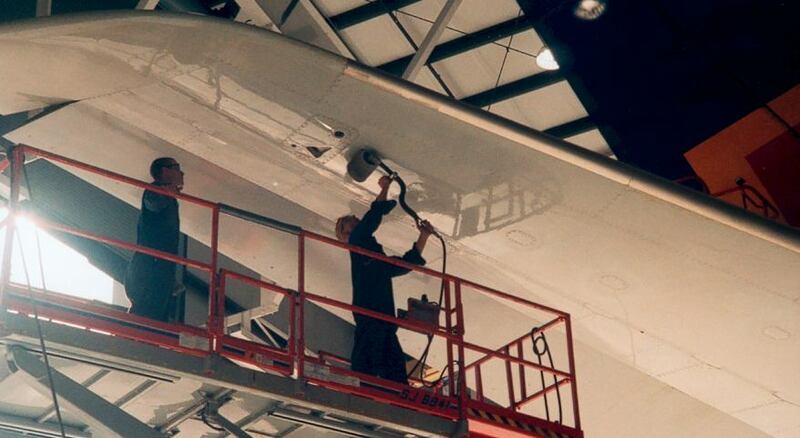 Try maneuvering a lift between the fuselage and engine nacelle without sweating about hitting the aircraft. Accomplishing these jobs, with anything less than a SPEC "DRUM" type polisher, with a 2 ft (61 cm) extension handle(s) installed, is not only almost impossible, but downright dangerous. 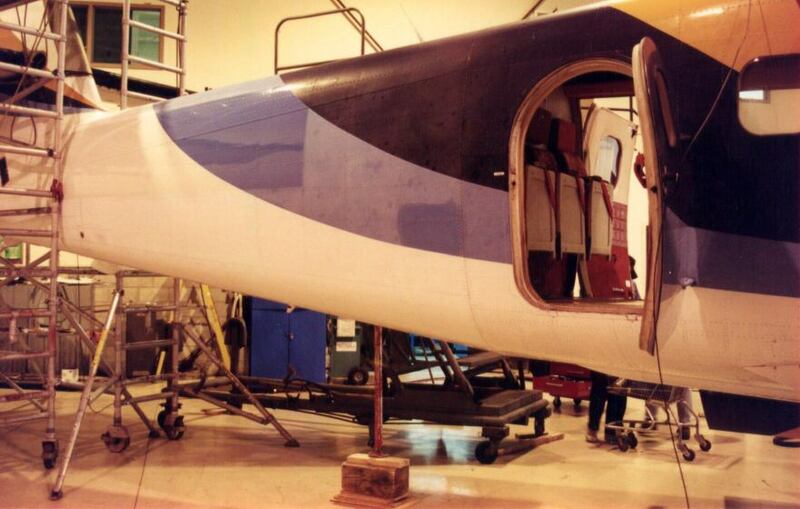 The less you have to maneuver a lift, around & next to, the aircraft, the less chance for "an accident". The job becomes quicker & more importantly, far safer, for all concerned. 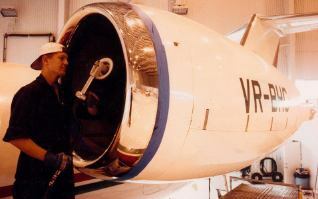 Above: "Drum" Type Buffer in use for paint polishing on a deHavilland TWIN OTTER. Note: Difference on polished sections of paint. 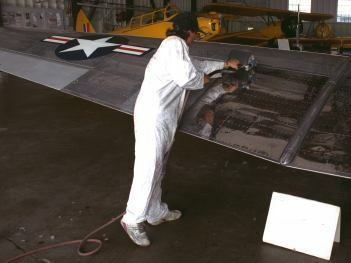 <--- Paint polishing & "Buffer Reach"
Below: Some delicate "Warbird" restoration work. Note the above sequence, from top right, clockwise. 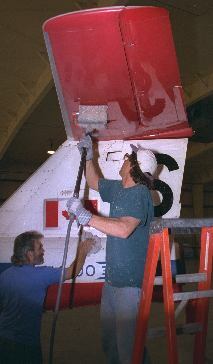 As the drum buffer is pulled down, (the "cut" stroke), the polish is applied and leaves a black residue. As the buffer moves back up, (the "color" stroke), pict B & C, the black residue dissapears, resulting in a highly polished finish, without the conventional "wipe out" step, common with circular polishers. The aircraft shown is a 1940's North American T-6 "TEXAN" belonging to the Canadian Warplane Heritage in Mt. Hope, Ontario. 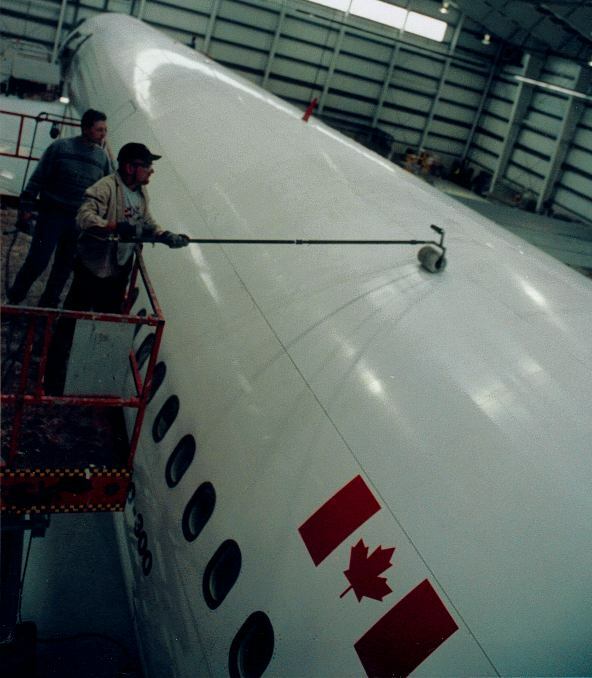 The polishing is by SKYWAVE Polishing of Toronto. 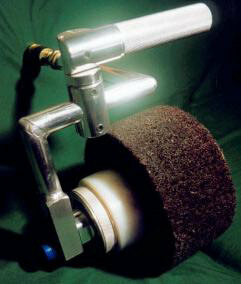 BELOW: One pass (cut & color) with a "DRUM" type polisher. What is rather interesting about this series of pictures, is; note the sticker and the yellow painted tip. No damage to each. This truly attests to how safe "DRUM" type of polishing is, to any given surface. Above: Engine inlet rings. A proper polishing not only looks attractive, but allows for proper and effecient airflow and eliminates the onset of corrosion. Below we find some difficult work at best. The alloy involved, by design, has to withstand extremely high temperatures and thererefore is very difficult to bring to a bright finish. That being said, the right products, equipment and techniques were able to acomplish the task. "TripleO" in England apply and Buff their proprietary "NANO Tech Coating"
Using a SPEC Model "LA" and the new "Y" YELLOW Synthetic Blend Pads. and to see a youTube video clip with a SPEC Model "LA" in action. 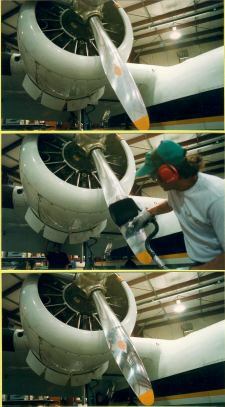 The Parker Hannifin "EZ-Mate" quick connect-disconnect SAFETY throttle, (Speed Control). Each SPEC  Machines unit comes with a Parker Hannifin "EZ-Mate" quick connect-disconnect SAFETY throttle. 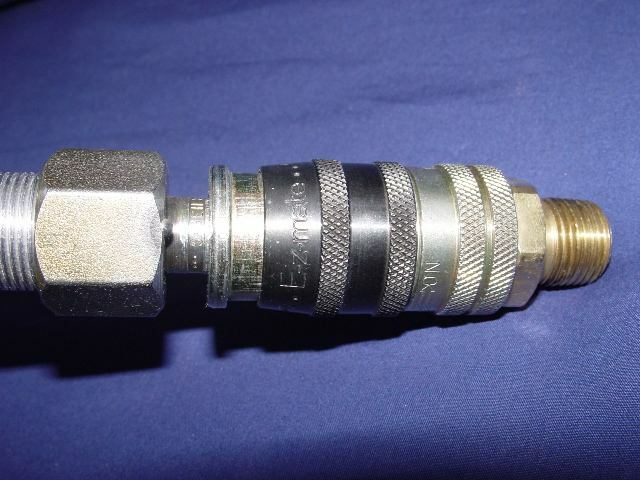 This unique design allows the throttle to be part of the air line, independent of the tool. Similar systems require a throttle with each tool. In a scenario where you have three types of tools but only one air line, you simply plug the tool directly to the line and you have instant throttle control. As an added saftey feature, the tool can only be connected (or disconnected) with the throttle in the CLOSED position. This prevents accidental connections to a 2 hp, open throttled machine, spinning at 2000+ RPM. (The results can be quite exciting.Trust me, I know!) 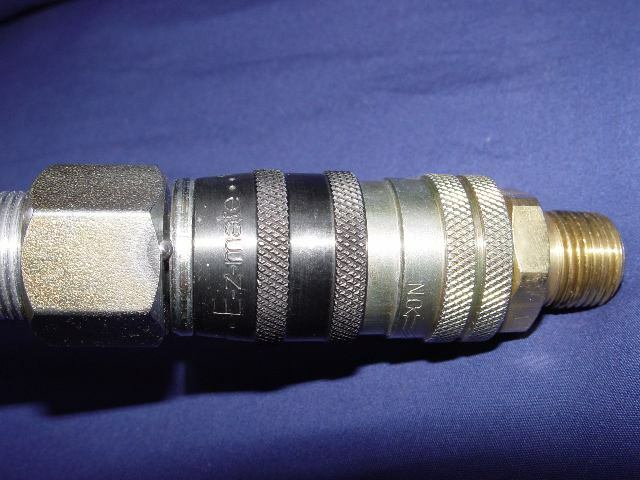 The "EZ-Mate" has venting ports, that "exhaust" down stream air to atmosphere, so disconnect is at ZERO pressure, thereby eliminating dangerous "HOSE WHIP". The "EZ-Mate" is not only safe but allows the operator "precision" speed control of the tool. 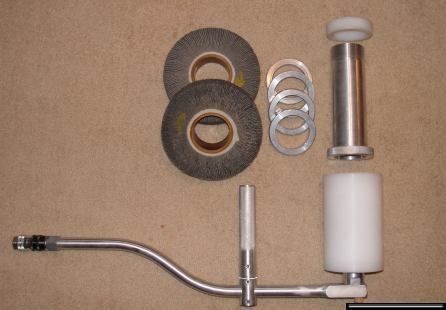 To see the SPEC Machines "Detailer", a smaller "mini" drum type polisher for smaller parts / areas, click here. E-Mail us at your convenience. To see the next page on SPEC Drum Type Buffing Pads, click the right arrow above.